It's Christmas time and the city center in Erlangen is all decked up.Christmas markets are in full swing and the hot mulled wine is flowing.. I've had my quota of KinderPunsch (children's drink) and Hungarian Langos. What I find really strange is that there is absolutely no change from last year's market - the stalls are the same, the people are the same and even the location of the stalls are the same. Nothing new at all. It is all so predictable. Finishing an embroidery piece has not been my forte. But I have admired those who frame their pieces in hoops or frames. And I love the little fancy frames. 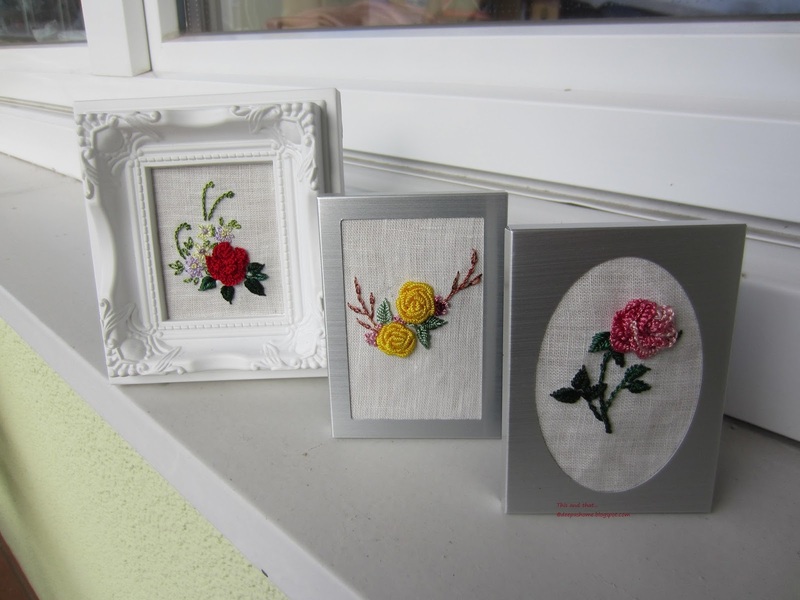 While embroidering these roses, I had imagined them framed in the pretty little frames . But I had no idea how to go about it. Last week I paid a visit to the 1 Euro shop in Erlangen and found these frames. Not what I had envisioned, but was good enough for a trial. Most framing tutorials ask for mounting board/foam board. I have no idea what it is called in German and where to get it. So I used cardboard cut off from Amazon packaging [grin]. I guess since the pieces were very small, the cardboard worked fine. I like this red rose. Cast on stitch is a little more versatile when compared to bullions for making roses. We can use it to create flowers in different angles. 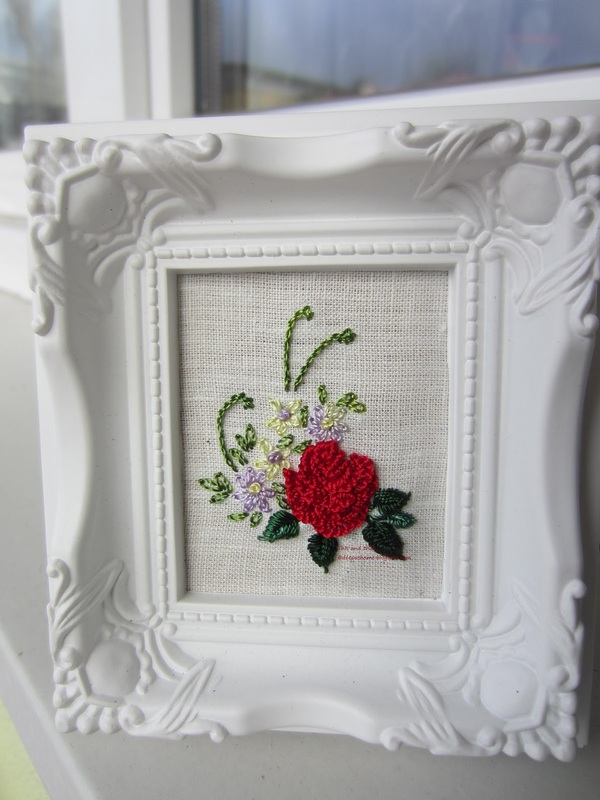 Right now, I am enjoying embroidering roses and of course framing them. 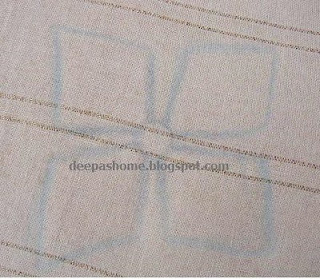 The only worry I have is that the embroidery is not covered and is bound to get dirty...what then?? Remove, wash and reframe? Has anyone among you done that? You can keep them from getting dusty by covering the head of the vacuum cleaner with muslin or net, and running it over the frames and their contents when you vacuum. Don't let it touch, but you should find that keeps them fairly clean. Mount board is the sort of heavy, dense cardboard used for mounts (or "mats", some people call them) for paintings. There are conservation-grade, acid-free boards which won't damage your embroidery, and I would expect a framer to know about them, but I don't think your Amazon packaging will do much damage, at least in the short term (say, twenty years or so?). I was going to suggest the same thing as Rachel did about covering the vacuum hose. I agree with you that the Christmas craft shows are much the same every year and I have to admit I haven't been to one in several years just because of that. I have more fun poking about on the internet. I love your pretty Christmas roses. I have always been told that mounts have to be acid free but I am wondering for small projects like this whether you could wrap the card mount is some acid free tissue paper before framing? You could put the roses in box frames and put them on the wall. They would then be protected by glass but less clear perhaps and some people find the box frames a little chunky. 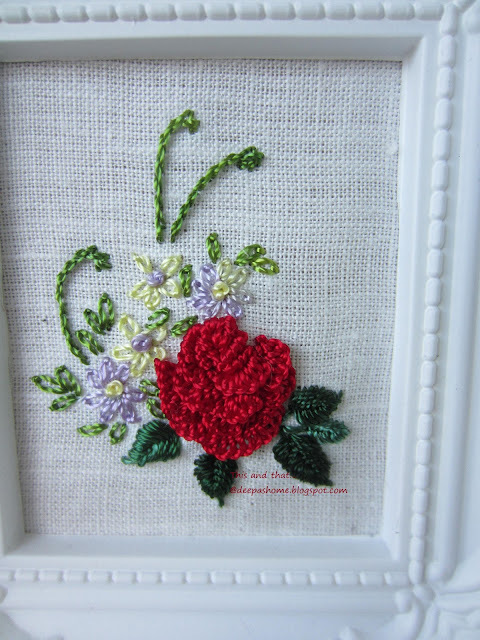 Love the roses, especially the change from a bullion stitch. Your stitching is beautiful! A rose for a rose?! I have stumbled through a few framing projects along the years. Whatever you did turned out great. Blessings. You should be able to find foam core board in an art/craft supply shop. It is available in different thicknesses. Hardware stores might have the thicker version. Aha! Your rose is beautiful! Funnily enough I saw a cast on stitch video on utube recently and have been meaning to have a go! Haven’t yet but seeing your rose I really must try! Can’t be any help with framing I’m afraid, except to say that I love the white frame! Interesting tip from Rachel about hoovering ..... not sure I’d be brave enough to do that! I would have considered a gentle wash from time to time, but with red, and after your previous experience of the red running ..... possibly not ideal! Oh, and I’m sure you must use something acid free ..... it is surprising the marks that can occur over time with ordinary card ..... I have found that on some of my old scribblings from years ago. Such beautiful pieces! I think you've done a great job of finishing them in those pretty frames. Mount board is reasonably easy to come by on Amazon itself, though as others have said, I've no doubt using the packaging is more than satisfactory! Your embroidered flowers look good in the frames. The Cast On Stitch make grand flowers. You could ask Jessica Grimm the word for mount board in German - she is German and speaks excellent English (and she's an embroiderer of course!). You'll find her blog on Google. Your embroidered roses are beautiful. Love the frames, especially the ornate one.